A short time back I mentioned that in my rips of 2013 Topps, I have pulled 4 die cuts of two players. Offered my extra Darvish and Adam Jones for trade, and the waxcaptain emailed me about the Darvish. 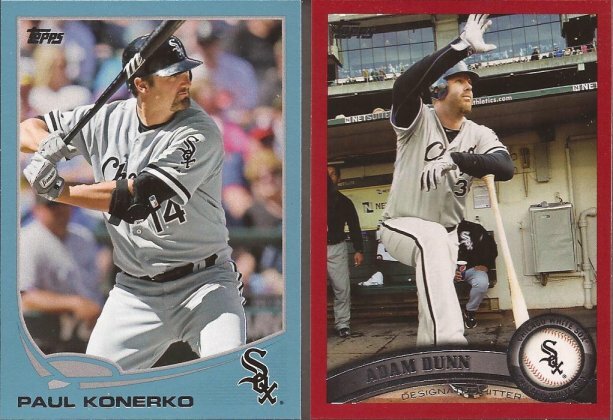 A quick PWE later and the captain has his Darvish and I get these to enjoy in return. Oh minis, how I love thee! Two years worth of Konerko minis crossed of my list. Gotta like that. And the captain loves to deal in color. I have neither insert - now I do!! Victoriano also included a couple Sox '13 base as well as two Linage cards that I needed - well selected from the blind, Captain!! Thanks a bunch for the quick trade and for padding out my binders with more needed White Sox. Go hit up Victoriano for a great and quick trade. BTW - still have the Jones if someone wants it. Makes me happy that you liked your end of the trade. I'm proud of myself for knocking some cards off your want list without even knowing. 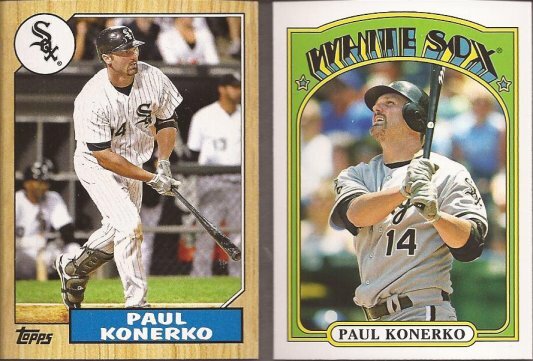 Gotta love adding some new Paulie cards to the collection! From your title, I assumed you were referring to him (is he still the Captain of the team?). I'll havta make a trade with this Captain of Wax. 1987 Topps.. hmm, maybe Topps should revisit that design.